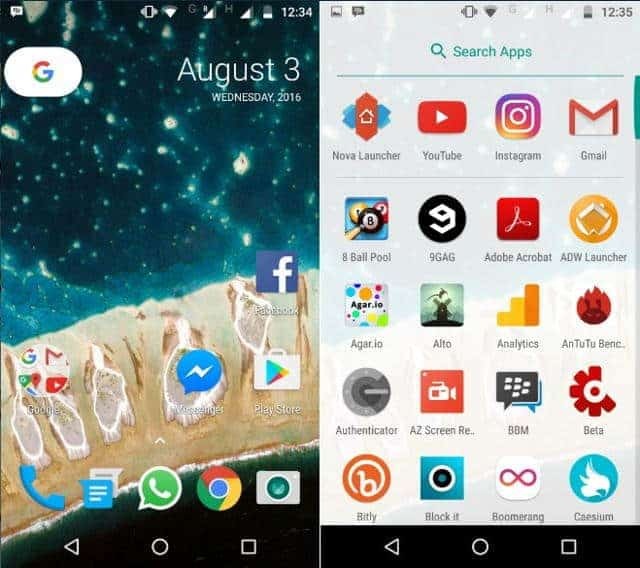 Last night we got a glimpse of the upcoming Nexus Launcher, which will be used on the upcoming Nexus phones instead of the traditional Google Now launcher which was in action for a long time and we also talked about the changes a bit. Now looks like the Nexus Launcher and also the Wallpaper picker got leaked and available for download. One of the Android fans on Google+ first shared the APK so that people can sideload it on their phones. The new Nexus Launcher is pretty different. The Google Search Bar Widget has vanished and has been replaced by a small ‘G’ icon, by tapping that you can access the Google Search. Also, the app drawer icon is missing now and you will have to swipe up to open the app drawer. Hopefully, Google didn’t remove that. Now, the question is how to get it on your phone? Just follow these simple steps. There are two menthods, I’m describing both as there may be some issues. Head over to this Dropbox link and download the Nexus Launcher APK and Wallpaper Picker APK. Remember to enable app install from unknown sources if you haven’t enabled and you’re done. Sadly, when I tried the APK I didn’t find out any option to access Google Now. If you want to enable it you will have to flash the zip via TWRP to enable everything- including swipe to go to Google Now, setting different wallpapers and all. Here’s how to do that. Remember that, the second method will work only with rooted phones having TWRP recovery. Download the flashable zip from our Dropbox. Turn off your phone and boot into TWRP recovery. Flash the zip and you’re done. This process will install the Nexus Launcher as default launcher, for your phone and you will be able to enjoy all the features of it.